As of today, I won’t be a part of the (company) team. Not sure what else to say — I wanted to say goodbye to everyone, and around here a mass email seems like the most fitting way to do so. I’ve had a great time working with — and getting to know — all of you, and I got to do a great big amount of learning about design and production and the industry, and I’d like to thank you all for that, and for putting up with my occasionally clumsy ways. Thanks for everything, and best luck to all of you! I’m sure there are great things ahead for (the company). …and then he immediately got up and walked right out. I was like whoa! how abrupt and bizarre was that? Totally out of left field, and so soon after the big announcement. I just didn’t know what to make of it. No closure, no saying goodbye (although not like I blame him, I don’t like goodbyes or confrontation either). So that’s that. Our little office is now one person less. (Production Artist), you are truly a class act. We’re so sorry to see you go, and we wish you the very best. You’re a talented and whip-smart guy, but that also means there’s no way you won’t land on your feet. David and I have been having a disagreement over a plant in one of our front yard garden beds. 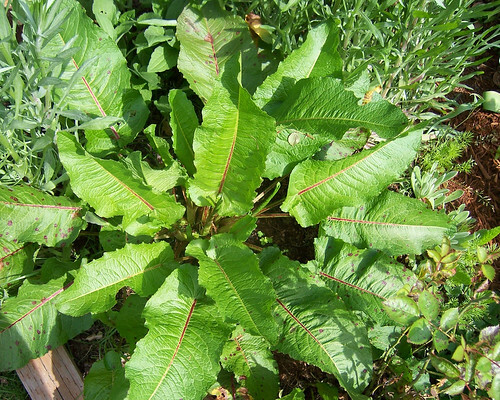 He insists it is a weed and I’ve been saying that it isn’t – or at least we should wait and see. After all, when we first moved here several bare looking patches eventually grew into stunningly beautiful plants, especially the bulbs, peonies and sedum. Luckily our next door neighbor that has lived here for twenty years is also something of a gardener. She warned us about which patches to leave alone and we’re lucky she did. Now that most everything indoors has reached the point of acceptability David and I are spending a lot more time working in the yard. It’s something we both enjoy and, David recently pointed out, that we’re well matched at. While I prefer to think about color, texture, foliage and do the pruning, planning and research on plants, he prefers to weed, transplant and mulch and do all the building of our raised beds, trellises, and retaining walls. We’re both learning so much, and have developed quite a library of reference – my favorite being the Sunset Western Garden Book. Finally! 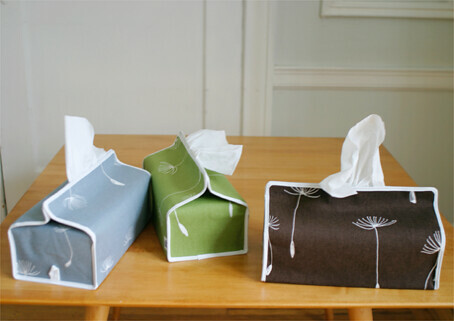 I have been waiting so long for these tissue box covers to come back in stock. I know, it sounds a little insane to be excited about something so seemingly boring, but these are like functional works of art – much nicer than those ugly cardboard tissue boxes with their out-dated graphics. I couldn’t decide which color I liked better, the brown or the green, so I went nuts and bought both. At $32 a piece, they are so not cheap. The real stinger is that they used to sell for $26, but I guess due to popularity and demand someone decided to up the price. I briefly considered waiting until they were back in stock at Greener Grass where they’re still marked the original price, but I’m tired of checking back. The first time I saw these covers in person was at Relish. I remember thinking how I would never pay that much and that I could probably make one for a fraction of the price. So I tried it. Yep, despite not knowing how to sew I went out and bought a yard of heather grey wool felt (because when felt is cut, the edges don’t unravel, so you don’t have to bother finishing them if you don’t want to) and gave it a shot. It actually didn’t turn out too bad, until that is, I decided to cut into the sides to do a layered felt/embroidery design and completely messed it up. Bummer. I would have saved myself a lot of time and hassle if I had just bought the thing in the first place. I’ve been seeing a lotta (ooo, I shouldn’t have!) Lotta Jansdotter items around lately, even at New Seasons, my local grocery store. Her refreshingly natural, abstract designs and useful home accessories are a welcome change in a world of often ignored everyday items (like tissue boxes!). Afterward: The covers have arrived and they look great! I’ve found that because we use the Costco-sized packs of 300ct. Kleenex, the boxes are too tall to fit the covers properly. So I cut the box top off about a third of the way down, which allows the velcro strips to close. Also, with the brown color, little white tissue flecks tend to build up over time, which you don’t notice as much with the lighter green color. Among my favorite local artists is Amy Ruppel. I first heard about her from Lisa, another freelance graphic designer, back when I worked at adidas. I think I remember Lisa (who is also a painter) say she was friends with Amy, and that for some reason every time she tried to buy one of her paintings online, she always seemed to miss out. Amy’s website and talents totally inspire me. She is both a professional designer, animator and artist. 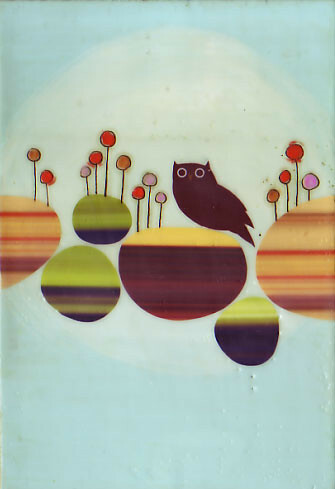 My favorite are her encaustic (beeswax) paintings of birds. I love how she has harnessed the web as a vehicle to promote and sell her work so successfully. At this point in her career, each online sale feels like an auction. Paintings go so fast, if you are not there at the time of opening, you pretty much miss out. The first painting of her’s that I ever considered purchasing was called “Life of Others.” David and I saw it during a “Last Thursday on Alberta” at The Office. It was a larger, much more expensive painting and I just couldn’t make myself part with that much money. David and I went away on a trip that weekend and by the time we returned it was already sold, which was probably for the best. However, during a later online auction I bought the one above, a much smaller piece at 5.5″ x 8″, called “In Tune.” It feels so lighthearted and sweet and I love the look and texture (and even smell!) of the beeswax. It currently sits on a little wooden easel on top of the dresser in our bedroom. Amy’s next online art sale is this Friday, April 27 at 11am. Our new Mac Pro just arrived a few days ago and because it has Bluetooth I was finally able to download all the pictures from my phone. 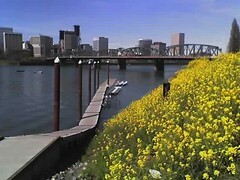 I took this photo a few weeks ago on a lovely, sunny spring day during an afternoon walk. These images were shot pretty much within seconds of each other, so have no idea why the first one turned out so blue. But it looks pretty cool, especially in comparison. 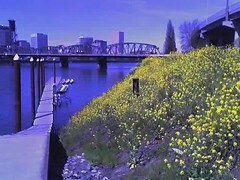 I’ve lived in Portland for almost 7 years now, longer than I’ve ever lived anywhere except for Falls Church, Virginia, where I grew up. All I can say is that it is so much nicer here, so laid back, so open to art and design and nature and generally just a happier place all around. I would never have guessed that my journey would lead me here, but I’m glad it did.